Request a quote for a bulk order for DNMT3A polyclonal antibody - Classic. Please fill out the form here below. Your local sales account manager will get in touch with you shortly and send you a quotation based on your requirements. Polyclonal antibody raised in rabbit against human DNMT3A, (DNA methyltransferase 3A), using a KLH-conjugated synthetic peptide corresponding to amino acids 44-58. 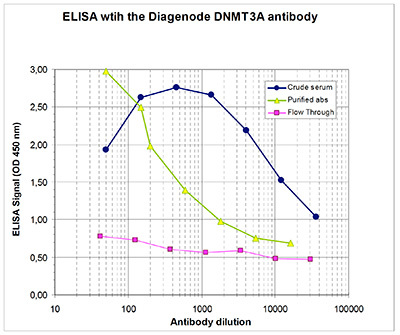 To determine the titer of the antibody, an ELISA was performed using a serial dilution of Diagenode antibody directed against human DNMT3A (Cat. No. pAb-084-050), crude serum and Flow Through, in antigen coated wells. By plotting the absorbance against the antibody dilution (Figure 1), the titer of the antibody was estimated to be 1:500. Human embryonic kidney cells (HEK293T) were transiently transfected with an expression vector for GAL4- tagged DNMT3A. Whole cell extracts were immunoprecipitated with 2 μg of antibody against DNMT3A (Cat. No. pAb-084-050). 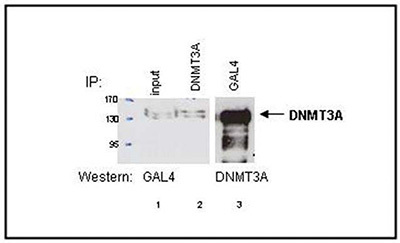 The presence of GAL4-DNMT3A in the non-treated cell extracts and in the immunoprecipitates was demonstrated by western blot analysis with anti-GAL4 antibody (lane 1 and 2 respectively). Alternatively, GAL4-DNMT3A was immunoprecipitated and western blot analysis was performed with the DNMT3A antibody (diluted 1:2,000) (lane 3). DNMT3A (UniProtKB/Swiss-Prot entry Q9Y6K1) catalyses the genome wide de novo methylation of CpG residues. DNA methylation on CpG residues by DNMT3A regulates gene expression and is essential for development. DNMT3A is strongly expressed in embryonic stem cells, but low in adult somatic cells. DNA methylation is coordinated with methylation of histones. DNMT3A binds to SETDB1 and HDAC1, and is involved in the repression of transcription from promoters containing an E2F binding site. Diagenode strongly recommends using this:	DNMT3A polyclonal antibody - Classic (Diagenode Cat# C15410084 Lot# A66-001). Click here to copy to clipboard.